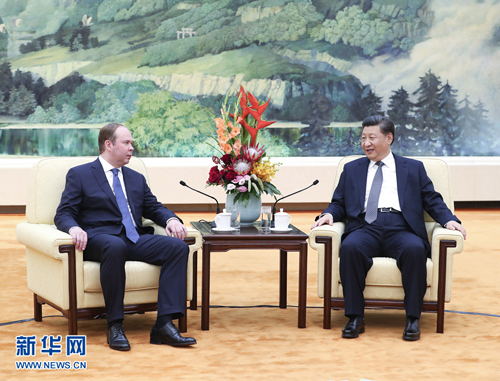 BEIJING, Oct. 17, Chinese President Xi Jinping met with Anton Vaino, head of the Administration of the President of the Russian Federation, in Beijing Wednesday. Xi asked Vaino to convey his greetings and warm wishes to Russian President Vladimir Putin, saying he and President Putin had maintained close contacts, which played a guiding role in the in-depth development of China-Russia comprehensive strategic partnership of coordination. Sino-Russian relations are at their best period in history. Under the current world situation, China and Russia should cherish the bilateral mature and solid partnership and unswervingly deepen cooperation in various fields, said Xi. Xi called on the two sides to promptly implement the consensus reached between the two presidents, deepen the cooperation in such areas as energy and innovation, accelerate the synergy between the Belt and Road Initiative and the Eurasian Economic Union, and intensify communication and coordination in international affairs. The two sides should design and plan high-level bilateral exchanges in the next stage and push China-Russia relations in the new era to a new level, said Xi. Xi said the cooperation mechanism between the General Office of the Communist Party of China (CPC) Central Committee and the Administration of the President of the Russian Federation serves as a special channel in bilateral exchanges. The mechanism is very important and also reflects the particularity and importance of Sino-Russian relations. Expressing support to maintain that mechanism, Xi called on the General Office of the CPC Central Committee and the Administration of the President of the Russian Federation to implement the cooperation consensus reached by the two leaders, so as to better serve the overall development of bilateral relations. Vaino conveyed President Putin's greetings and best wishes to President Xi, saying that Putin spoke highly of the in-depth talks with Xi during the Fourth Eastern Economic Forum in Russia's Far Eastern port city of Vladivostok in September and looked forward to meeting with Xi again. He said the strategic cooperation with China is a priority for Russia's foreign relations, as bilateral ties are at their best level in history and their cooperation could be considered as a model in the international relations. The Russian side was glad to see the two leaders maintain frequent exchanges and the governmental departments of the two countries have active cooperation, said Vaino, adding that the traditional friendship between the two peoples also provided a fundamental guarantee for the development of bilateral ties. Vaino said the cooperation mechanism between the Administration of the President of the Russian Federation and the General Office of the CPC Central Committee is an indispensable part of Russia-China cooperation. He said the Russian side will further strengthen cooperation between the two offices, earnestly implement the consensus of the two leaders, and make new contributions to the development of Russia-China comprehensive strategic partnership of coordination.